Woods Cabin está ubicado en el corazón del soleado North Shuswap en la hermosa Celista, BC. Hemos estado alquilando nuestra cabaña desde 1990 a familias de todo el mundo. La cabaña es bastante pequeña pero tiene todas las modificaciones para complacer a su familia. La cabina duerme 6 con un dormitorio principal en el piso principal y un loft para los niños. Las características incluyen 300 pies de playa, lanchas privadas, muelles, boya privada, HDTV Shaw Direct HD, DVD, aire acondicionado, playa privada con pozo de fuego, terraza, internet inalámbrico disponible, solicite una contraseña a la llegada. Barbacoa. Lo siento, no hay teléfono, pero un buen servicio celular. Debe proporcionar su propia ropa de cama. Sin lavadora ni secadora, lavandería ubicada a 10 km. Una excelente ubicación ubicada justo al lado de Pebble Beach y Witchy's Trail. Totalmente amueblado, impresionante vista, ubicado en el centro, a 8 minutos de la araña Mnt best-ATV senderos alpinos. A poca distancia de almacenar y parque comunitario. 8 minutos a Shuswap Lake Provincial Park. Pubs, restaurantes, casas de café puertos deportivos. Servicio mecánico marino móvil. Familia Fun Center (mini golf, sala de juegos, bolos y botes de choque). Camping cercano. Thanks for the lovely review for our cabin. We sure hope that these wildfire issues improve in the future and doesn't become the new norm. Blue skies and clean air are the best way to experience this BC jewel. This was our 3rd year staying at Woods Cabin. We enjoyed our stay with our 2 dogs. The cabin is 30 yards from the crystal clear water. The cabin is thoroughly equipped with everything you need to prepare meals. There are games and books for a day of rain. The gem for us besides the water is the deck, which looks out over the water. It is very spacious. The smoke from the wildfires hampered the outdoor activities for a few days, but other than that it was lovely. Thanks you again Wayne and Paula for your hospitality! We played on the beach all week! The deck is lovely to sit on and have breakfast and coffee in the mornings, and it had a gate so our dog was able to hang out on the deck with us. We launched our boat right from beside the house and the buoy was easy to swim to. Overall we had an amazing stay at the Woods Cabin. Our kids loved the loft! I’ll be keeping my eye out to book there again! Absolutely perfect spot for us, what with having a boat. Loved the buoy, dock, beach, cottage. Wonderful, caring hosts, went above and beyond to ensure we were comfortable and had all we needed. Loved by all. Will return for sure. Great cabin in great location with great owners. All you need to have a memorable week away with the family. 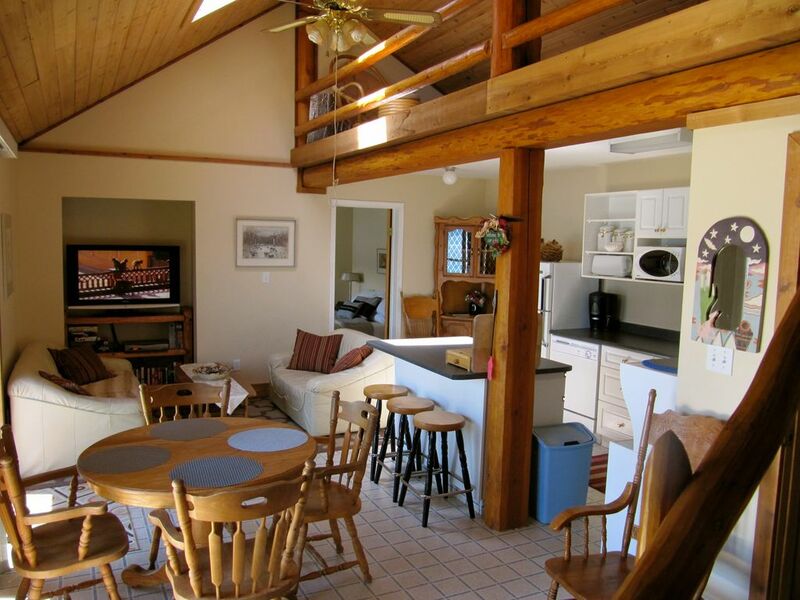 Amenities, beach, clean water, large deck, fire pit, great view, friendly owner and beautiful area of the world. Don’t forget to check out zorb balls close but they are a blast! Alquiler de canoas y kayaks y motos acuáticas cercanas, rafting en aguas bravas, 2 campos de golf, senderos para bicicletas de montaña y escuela, escuela de wakeboard, deportes acuáticos, rutas de senderismo, centro de diversión familiar. Lugares de desove de salmón de fama mundial (septiembre-octubre). July-Sept 4 $1600.00/week Sept 4 & June30 $1400.00/week Long Weekends outside summer $500.00 All rates are in Canadian funds. Sunday to Sunday. Check In:2:00PM.-Check Out:11:00AM. Single Families only up to 6 max.best for smaller family. Deposits are refunded 7 days after departure. Sometimes the Shuswap best weeks are in June or September. "Just ask the locals".